Beauty is in the Eyes of these Beholders! Eliza of Eliza’s Eyes and Celebrity Cosmetic Surgeon Dr. Amiya Prasad launched their joint event, “The Ultimate Night to Beautiful Eyes” on April 12, 2011 at Dr. Prasad’s office on East 66th Street. 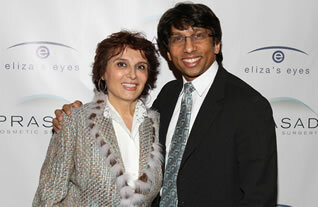 Eliza, better known as “The Queen of the Arch”, was very excited to have Dr. Prasad as a joint sponsor for this event. Dr. Prasad is known internationally for his artistry with rejuvenation of the eyes and is the author of the book, “The Fine Art of Looking Younger, A Leading Cosmetic Surgeon’s Guide to Long Lasting Beauty”. He is known as the “go to surgeon” for naturally beautiful eyes. Both Eliza and Dr. Prasad have been featured in the media and are frequently seen with celebrities at events and fundraisers in Manhattan and the Hamptons. At the “Ultimate Night to Beautiful Eyes” event, both Eliza’s team and Dr. Prasad’s team performed samples of their state of the art services for the attendees to be featured in their forthcoming “Ultimate Guide to Beautiful Eyes”. Dr. Prasad provided anti-wrinkle treatment around the eyes (crow’s feet lines) using new technology called Pelleve (non-surgical radiofrequency stimulation of collagen while Eliza and her team of associates worked their eyebrow shaping magic. The combination of rejuvenation services provided that evening allowed many people to go home that night feeling younger and glamorous! Dr. Prasad and Eliza frequently work together after cosmetic eyelid rejuvenation surgery. “Eliza does a beautiful job shaping the eyebrows. She makes everyone’s eyes look even better after eye surgery” comments Dr. Prasad.